Now is the time to make sure all your equipment is in the best possible condition to give yourself the best possible start to the upcoming season. The Service Teams at Kenway & Clark, across all our branches, appreciate you need to be prepared. 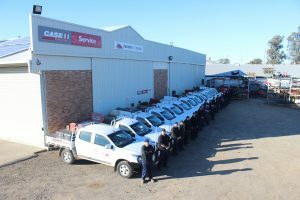 That’s why they’re on hand for you to book in your machinery for pre-season inspection and service on your sprayers, tractors, trucks and other equipment. The Kenway & Clark Service Teams pride themselves on their work which means that you can pride yourself in your work. Backed by the experienced Kenway & Clark Parts Department, with a multi-million dollar inventory, you can have every confidence that your machinery is in the best of hands. Less down-time equals more ground-time. Our technicians are equipped to call on you with their “Mobile Field Service Vehicles”. Before you get sowing, get going and book your pre-season inspection & service at your local Kenway & Clark branch. And now that harvest is behind us, don’t leave it until next October to book in your combine and trucks for their annual check-up. Do it now and be ahead of the game.